Australia are straight back into action today following their disastrous tour of England when they play Pakistan in Harare in the first match of their Twenty20 tri-series in Zimbabwe. T20 is Pakistan’s best format – they are the number one ranked Twenty20 team in the world, and have long been at or near the top of these rankings. So this tri-series should offer Australia both a major challenge, against Pakistan, and relative respite against the struggling Zimbabwe, who are ranked 12th in the world in the format. Australia slid from second to third on those rankings after their loss to England in the one-off Twenty20 last week, but dominated in their last tri-series four months ago against England and New Zealand. Here is the key player to watch from each of Australia, Pakistan and Zimbabwe. 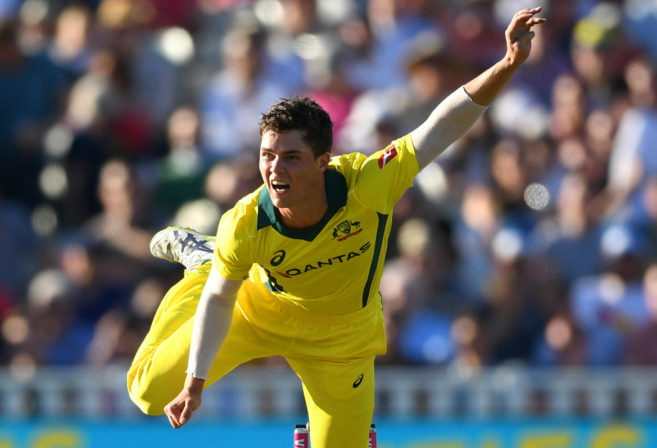 Australia’s attitude towards spinners seems to be softening in white ball cricket, with the Aussies playing two tweakers in each of their last three matches on the just-completed tour of England. Leg spinners are now by far the most effective style of bowlers in Twenty20 cricket so Australia will be keen to identify their best wrist spin option two years out from the next World T20 tournament. Quite incredibly, wrist spinners account for six of the world’s top seven ranked Twenty20 bowlers. Queensland leggie Mitchell Swepson has a gilded chance to lock down a spot during this series. He’s fortunate to have this opportunity having curiously pinched the position of fellow leggie Adam Zampa. Zampa has been brilliant during his brief Twenty20 career, with 17 wickets at an average of 15 and a miserly economy rate of just six runs per over. Zampa’s omission is the single biggest selection blunder in this Australian squad. Swepson is coming off the worst Big Bash League campaign of his career, having taken just five wickets at an average of 50 from his ten matches. But there’s no doubt he has considerable ability, particularly in T20s and first-class cricket. Swepson bowled okay in the one-off match against England, with 2-37 from four overs, although both of his wickets were from rank half-trackers. Shadab is a freak. At just 19 years of age, the leg-spinning all-rounder already has adapted to both ODIs and T20Is with ease. In ODIs he plays as more of a batting all-rounder and averages 51 with the bat and 28 with the ball from his 17 matches. In T20Is, his skiddy leg spin has come to the fore, earning him a sensational record of 27 wickets at an average of 15 with a remarkably frugal economy rate of 6.19 runs per over. Already Shadab is the number two ranked Twenty20 bowler in the world, behind only Rashid Khan. Australia’s weakness against spin was exposed once more on the tour of England when Adil Rashid and Moeen Ali toyed with their batting line-up. Shadab is already as good a T20 bowler as Rashid, so that spells peril for Australia’s batsmen. Like Khan and Rashid, Shadab has a fantastic googly, but he also has a better leg break than either of those bowlers. Shadab also boasts a lovely slider – a delivery which looks like a leg break out of the hand but which skids on off the pitch, helping him secure plenty of bowled and LBW dismissals. The battle between Shadab and Glenn Maxwell, Australia’s best player of leg spin, should be a delight. Yes, it’s another wrist spinner because, as noted above, these bowlers dominate the shortest format and, in Cremer, Zimbabwe have a damn handy one. Cremer is more of a traditional leg spinner than the likes of Shadab Khan or Rashid Khan in that he looks to flight the ball and beat batsmen in the air, whereas the two Khans try to dart the ball in and defeat batsmen off the deck. Cremer gets sharp drift on his deliveries due to the heavy revolutions he imparts on the ball. But he doesn’t rely on his ripping leg break, Cremer also has a fine googly. He will likely loop the ball more than any other spinner in this series, inviting the batsmen to try to hit him over the top. The likes of Maxwell and Finch will try to do just that.